Fueling: Both publicly accessible refueling sites and private on-site station. Challenge: To operate 10 percent of its fleet (or 300 vehicles) on propane autogas by 2015. $1.91 per gallon cost savings for propane autogas. $4,152 per vehicle, per year in fuel cost savings. 6,917 pounds of carbon dioxide eliminated per vehicle per year from ThyssenKrupp Elevator’s carbon footprint, based on their average 25,000-mile-per-year usage. 373,518 pounds of carbon dioxide eliminated annually from ThyssenKrupp Elevator’s total carbon footprint. In 2010, ThyssenKrupp Elevator’s fleet department started evaluating alternative fueled vehicles to explore ways to combat rising fuel costs, and to learn which fuels were sustainable now and for the next generation. Their quest resulted in the development of a protocol for analyzing alternative fueled vehicles — one that is serving as a model for other companies seeking to make the switch. According to Armstrong, the only product that qualified for all “Five C’s” was propane autogas. “When we laid out all the fuels available, including propane autogas, ethanol, biodiesel, compressed natural gas and electric, there was only one alternative fuel source that had a check mark in all five categories, and that was propane autogas,” said Armstrong. For ThyssenKrupp Elevator’s Phoenix-area service vans, miles traveled average 25,000 each year. This means that for each vehicle purchased in this market, ThyssenKrupp Elevator is reducing its carbon footprint by 6,917 pounds of carbon dioxide each year per vehicle. As for cost effectiveness, Armstrong said the average price for gasoline has hovered around $3.84 per gallon, while the company’s price for propane autogas averaged $1.93 per gallon. This alone provides more than $224,208 in annual fuel cost reductions to the company’s bottom line across the vehicles in their Phoenix market. Armstrong’s propane autogas vehicles have the potential to incur lower maintenance costs and increase the life of the engine because the fuel burns cleaner and experiences significantly less carbon build-up. With so many pluses, common sense pointed the company to commit to propane autogas. 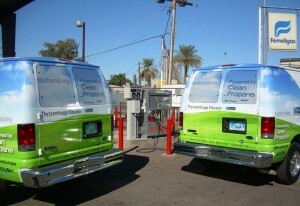 They started with three ROUSH CleanTech Ford E-150 propane autogas vans in Phoenix in 2010. Currently offered through authorized Ford dealerships around the country, the ROUSH CleanTech propane autogas fuel system delivers the same factory Ford performance characteristics and serviceability with a 5-year / 60,000-mile limited warranty. “Since our vehicles go home with our drivers, we needed adequate local fueling infrastructure for each city where we use propane autogas,” said Armstrong. The process includes entering the home address of each driver into a system and mapping out exactly where propane autogas fueling sites are needed. ThyssenKrupp researches various fuel suppliers that provide infrastructure in each area. In most situations, suppliers have area retailers where existing refueling equipment can be upgraded to include 24-hour accessibility, driver-operation, and credit card capability. These features give drivers the convenience and ease-of-use just like refueling with conventional fuels. There are thousands of public propane autogas refueling stations across the nation, and ThyssenKrupp’s other markets for propane autogas vehicles are based on areas that already have or are improving refueling infrastructure. In addition to using public sites, ThyssenKrupp has private refueling infrastructure at their Detroit branch. ThyssenKrupp Elevator has implemented many other green initiatives, such as using GPS dispatching for service vehicles to minimize mileage and improve customer response times, providing urea-formaldehyde-free elevator cab interiors, and developing regenerative-drive technology that uses gravity to regenerate energy and feed it back into the building. According to Armstrong, the company is committed to leaving behind a sustainable future for generations to come by operating a green fleet that minimizes impact on precious natural resources, conserves financial outputs related to fuel costs, and builds a foundation for moving their successes to other markets they serve. About ThyssenKrupp Elevator: ThyssenKrupp Elevator Americas is the largest producer of elevators in the Americas, with more than 13,500 employees, more than 200 branch and service locations, and sales of more than $2.7 billion. ThyssenKrupp Elevator Americas oversees all business for the operations in the United States, Canada, Central and South America. It is a subsidiary of ThyssenKrupp Elevator AG. About ROUSH CleanTech: Based in Livonia, Mich., ROUSH CleanTech offers dedicated liquid propane autogas fuel systems for a variety of light- and medium-duty Ford vans and trucks, and for the Blue Bird Propane-Powered Vision. Currently offered through authorized Ford dealerships around the country, the ROUSH CleanTech propane autogas fuel system delivers the same factory Ford performance characteristics and serviceability with a 5-year / 60,000-mile limited warranty. Customers can lower operating costs significantly while reducing vehicle emissions. 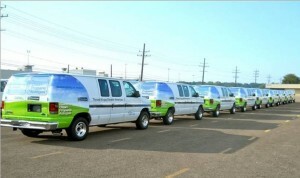 Complete details on ROUSH CleanTech propane autogas offerings can be found online at ROUSHcleantech.com or by calling 800.59.ROUSH.